Deemed a breakthrough in natural beauty, rms beauty mascara will give you lush lashes without all the harsh, drying chemicals. Created with rich mineral pigments and certified organic butters, waxes and oils, these two unique formulas are unlike anything you’ve tried before. Both formulas are designed to nourish lashes avoiding the drying effect of traditional chemical-laden formulas. Both can be easily removed with rms beauty raw coconut cream, keeping lashes moisturized and healthy without irritating the sensitive area around the eye unlike many makeup remover wipes. The volumizing formula is paired with a fuller, more traditional brush to separate lashes and beautifully intensify all of your lashes. 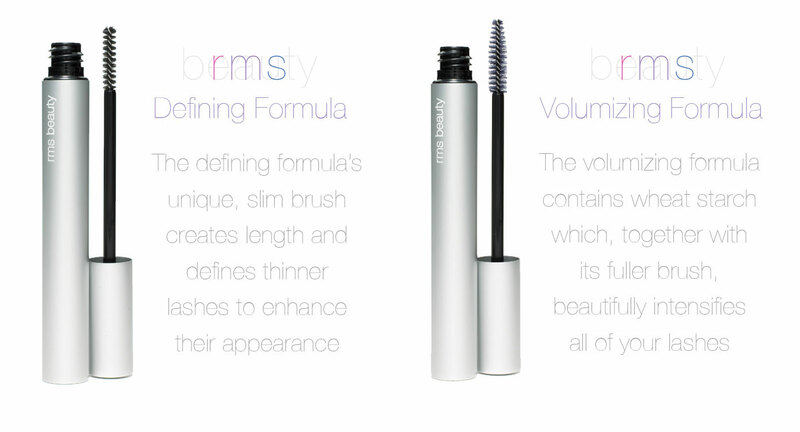 The defining formula has a slim, streamlined brush for better application on so-called “challenged lashes”. For those with lashes that are thinner or more sparse, the small wand allows for more precise control during application, avoiding a mess on the lid. It thickens and coats each tiny lash making for an over-all dramatic lash. The two formulas can also be used together to create a striking look for an evening out. Imagine what it can do if you already have fuller lashes…you will be impressed!